Metallica is gearing up to unleash a reissue of “The $5.98 EP – Garage Days Re-Revisited” on Friday (April 13), just ahead of Record Store Day 2018, and the metal guys have released a new video trailer for the set. The 3-minute clip features images of the vinyl record spinning on a turntable with the backing sounds of Metallica’s heavy metal riffing and rhythms. A new video trailer for the set can be viewed below. First out in August of 1987, the EP came sandwiched between “Master of Puppets” and “… And Justice for All,” packing covers of tunes by Diamond Head, Holocaust, Killing Joke, Budgie and the Misfits. At the time, the EP was a limited release, and it’s been out of print since 1989, which makes this year’s remastered version of major interest. The remastered version will be released as a CD and digital download, as well as in various vinyl versions, including a picture disc, as a cassette and in a longbox. 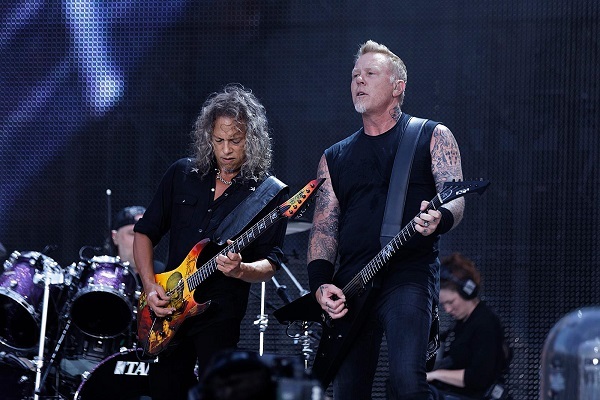 The guys of Metallica are currently touring overseas, and they’ll return to the U.S. to perform at the sixth annual Metallica Night with the San Francisco Giants at AT&T Park on April 23.